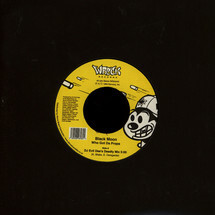 The first in a series of all-time classic hip-hop anthems from the Nervous vaults, pressed onto high quality dinked 45's. Remastered from the original source material and featuring the unedited 'dirty' version on the A-side, and the full instrumental on the B-side, these 45's are for the heads who know what time it really is! Black Moon's 'Who Got The Props' needs no introduction, it's place in hip-hop history is fully solidified. Tytuł Who Got Da Props?